Here is another pickle from my kitchen. In my family everybody loves pickle, so I prepare it often. I cannot eat curd rice without pickles. In fact I prefer pickles as a spread for bread rather than jam. Luckily I do not have a sweet tooth.This pickle goes well with parathas also. Today we will learn how to make lemon pickle/Elumichai oorugai following this easy recipe. Wash the lemons and wipe it dry with a towel. Cut lemon into 8 small pieces. Remove as much seeds a you can. If there are a few seeds, it does not matter. Add turmeric powder, salt and mix well. Leave it for a minimum of 3 days. Every morning, just mix it well with a dry spoon or shake it well and keep it closed. Then add chilli powder and cook for a few more minutes until the raw smell of the chilli powder goes. Then add fenugreek powder, mix well and switch off the gas. Leave it to cool. After it cools, store it in a clean glass bottle inside the refrigerator. If handled properly, it stays good for 6 months in the refrigerator. You can keep the bottle inside the refrigerator and take only needed quantity daily from the bottle. Note - If using iodized table salt or iodized rock salt, reduce it a little. Also I have used homemade chilli powder which is not hot. If using store bought chilli powder, reduce it a little than the quantity mentioned. I have compiled all the pickles recipes in one page. Do check out more variety of Pickle Recipes. 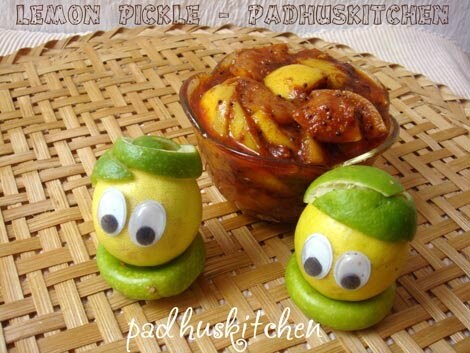 Padhu, I love lemon pickle..lovely presentation Dear..
Great job dear....the color rocks...! i love the way you present,iam your great fan,padhu. Lemon pickles looks delicious. I love the two lemon guys. lemon pickle looks so tempting..mmmm!! aww...cute pics...i just LUV the lemon pickle...nice blog...on my way followin it!!! Pickles..yummm! Where's my share ya! :D hehee take care! I am fond of pickles and lemon pickle ismy favourite. Thanks for your lovely recipe. Lemon pickle looks tempting and feel like having it now. Wonderful presentation. looks tempting padhu..love to gobble up with curd rice..nice presentation. heehee! these two lemon guys are so cute!! The lemon pickle looks so yummy!! I love the pickle but have never made it!! Would love to try it out!! Lovely presentation as allways. Mouthwatering pickle dear. Wow, that's a lovely presentation again. I always love the way you present the food. Love the recipe of pickle too. i made lemon pickle...it came good...it was sour....how to correct it next time? Which oil is advisable for seasoning for this lemon pickle? Unknown - You have to cut the lemon into half and remove the seeds manually with a knife tip or spoon. It does not matter if there are a few seeds but try to remove it as much as you can. My apologies for not replying to you immediately.I was on a vacation to UK and was back only yesterday. You can add the juice also as it is only lemon juice. It will not spoil the pickle. Thank you. I did not even add fenugreek powder, even before it, the pickle turned so bitter, I couldnt even taste anything else... Should we even cook the lemons? Is there anything I can now do to correct this? May be the lemon you used was bitter. Some lemons have thick skin which may be bitter. You have to cook the lemon well in oil and then only add chilli powder. I have written that clearly. You would have over fried the fenugreek seeds or you would have added more of it. After adding fenugreek powder,mix well and switch off the heat. Another reason could be - lemon variety. Is it necessary to keep the pickle in the fridge? We can't keep it outside? Yes, you have to keep it in the refrigerator. It might be due to the quality of lemons or you must have used green ones. The problem is not with the recipe but with the lemons. Some lemon skin has a bitter taste. This recipe is followed for generations in our home. It turned out really well. Thanks Padhu. hi is there any specific reason for it to be out for 3 days? i have cut and mixed the lemon in salt and turmeric today. can i saute it today in sesame oil or should i wait 3 days? It will turn a little soft in 3 days and will get mixed well with the chilli powder and oil.